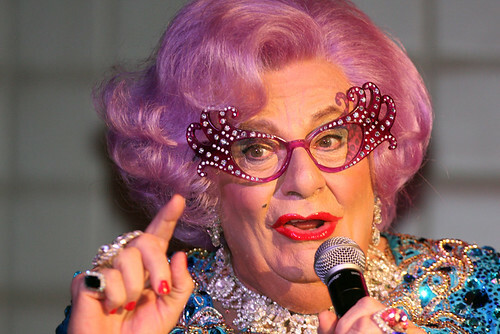 The Jenny Craig (Australia) official website reads: Dame Edna Everage is undoubtedly one of the most endearing Australian comic characters of all time, and one of the longest-lived comedic characterisations ever devised. Originally conceived in 1956, Edna has long since transcended her modest origins as a satire of Australian suburbia to become one of the most successful, best-known and well-loved comedy characters of all time. As Dame Edna Everage prepares for her farewell tour "Eat, Pray, Live,” she has turned to Jenny to help her lose 15 kilos and fit back into those gorgeous stage outfits she is renowned for. The new Jenny Craig ambassador announcement was always going to be hard to keep a secret! The new Jenny ambassadors are Dame Edna Everage and Barrie Humphries and they performed tonight at the Civic Hotel in Sydney. Barry Humphries is known for inventive ways to make a dollar, but this really takes the cake... so to speak. In a deal understood to be worth more in excess of $250,000 Humphries, now 78, has become an ambassador for the weight loss program around the same time he hits the Australian stage for his last ever shows. Jenny Craig is also snatching exposure by Humphries' alter ego, Dame Edna Everage, promoting the arrangement. Previous "Jenny" ambassadors such as Magda Szubanski, a recently self outed lesbian, have discovered, signing up to Jenny Craig also comes at a substantial personal price. Humphries have never been one to expose much of his private life in the public or media domain, is about to become a lot more public about his business and personal life and lifestyle. Humphries has previously endorsed companies such as Vision Australia and Myer. The rumour mill says he earned about $300,000 to front up Myers ad campaigns and make personal appearances at the store's Melbourne Cup marquee a few years back. You can bet news media is about to become a lot more intimate with Barry (and Edna), and as long as he's making a dollar (and loosing some pounds), he seems pretty content with it all possums.